While gulets originate in Turkey, travelers can also find these lovely boats available in Greece. 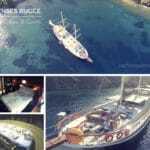 Should they not find one to their liking, Turkey is close enough to the Greek Islands that gulets can be hired in Turkey and then offer a blue cruise in Greece. Rhodes is a few hours away from the city of Marmaris. The island of Kos is too very close the Bodrum harbor. So if you embarked from either one of these ports on board a gulet, your itinerary can be planned mainly around the island of Greece. 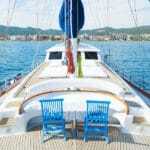 A gulet charter Greece vacation is also possible by embarking from Kos or Rhodes. 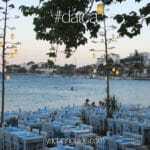 It doesn’t happen often, but can be arranged depending on the booking schedule of the gulet. 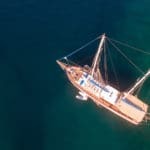 Alternatively for a delivery and re-delivery fee, the gulet can sail to either Rhodes or Kos islands and you can start your blue voyage from there. From the Dodecanese, to the Cyclades travelers can enjoy gorgeous places in the numerous ancient Greek Islands with an island hopping adventure. Depending on the gulet, the time of year and booking schedule, you may also plan to see the Ionians, Sporades and possible Crete as well. It’s best to discuss this with your agent at the time of your inquiry.